Various types of dinosaurs have lived in Virginia since that form of life evolved 230-240 million years ago, during the Triassic Period when Virginia was in the center of Pangea. As life refilled the niches, they had the advantage of walking upright, unlike the sprawling gait of salamanders and lizards. 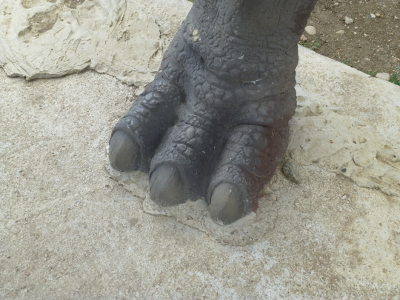 Dinosaurs grew fast, an essential characteristic since no Tyrannosaurus rex survived more than 30 years. Their lungs were especially efficient at extracting ocygen and removing heat, like the lungs of modern birds today. Dinosaurs first appeared in what is now South America, but at the start of the Triassic Period there were no separate continents. The supercontinent of Pangea allowed species on land to migrate without crossing any part of the Panthalassa Ocean. Fortunately, an animal with just one skeleton can create millions of tracks in its lifetime. Those trace fossils have a greater chance of being preserved and discovered, and dinosaur footprints have been found within Virginia. Herds of plant-eating dinosaurs and packs of predators walked across the muddy shorelines on the edge of lakes in Triassic Period basins. Those basins were created as the crust of Pangea cracked and the Atlantic Ocean opened up. 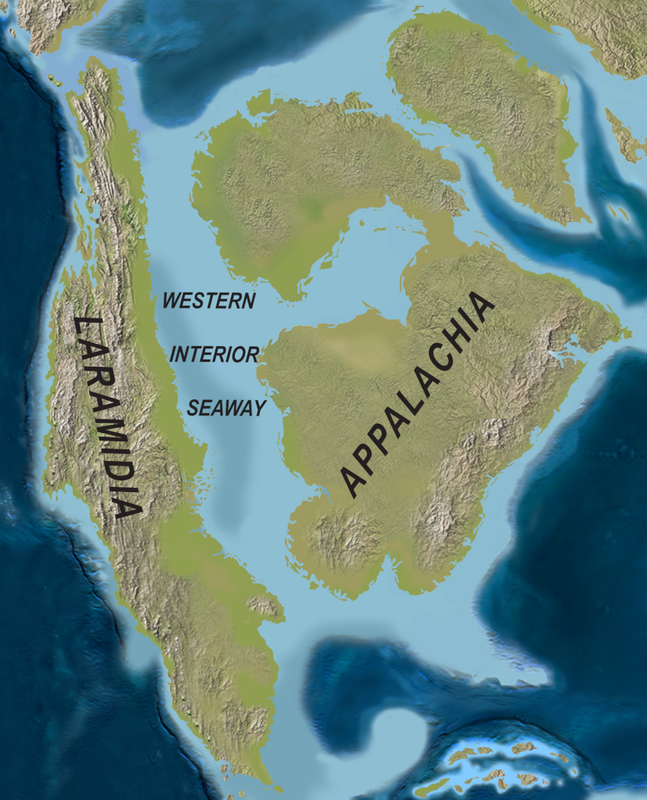 In what is now Northern Virginia east of the Blue Ridge, a lake sometimes as much as 60 miles long and 10 miles wide existed for 30 million years. 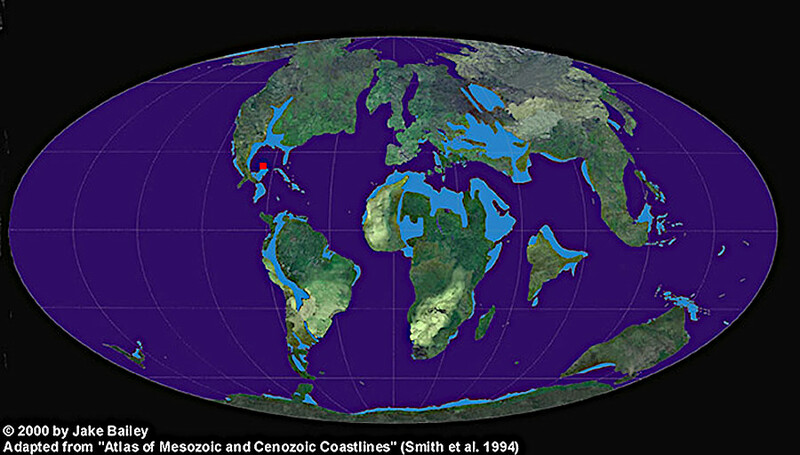 Tracks discovered in Triassic sediments show that other basins near Richmond and Danville were also home to dinosaurs. There were no flowering plants then; they had not developed yet. At the time when dinosaurs evolved, the day was only 23 hours long. (Since then, the moon has moved further away and the earth spins more slowly.) Monsoons swept across the continent, redistributing heat and moisture. Storms created floods, and floods deposited sediments. 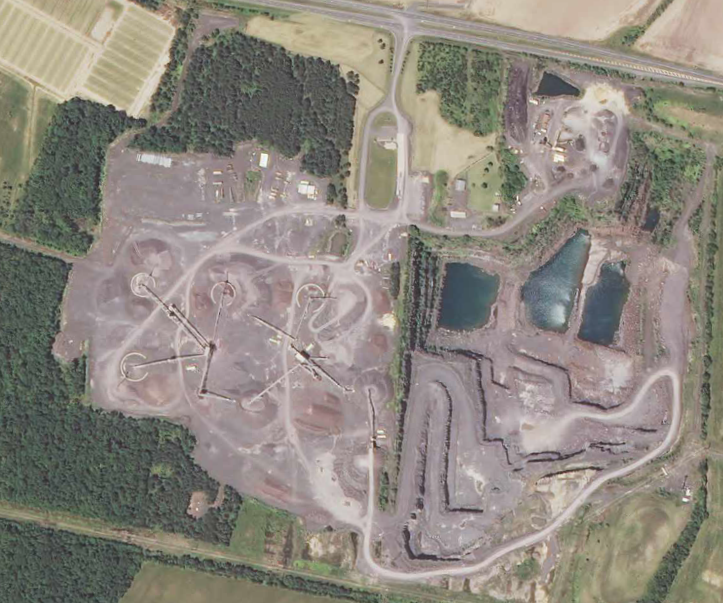 Occasionally, the ancient dinosaur trackways have been preserved and exposed later by quarry excavations. Animals that lived alongside the dinosaurs have been identified from those pits, including Pleurocoelus nanus, Pleurocoelus altus, Priconodon crassus, Allosaurus medius, and Coelurus gracilis. In the District of Columbia, the thighbone of a 10-ton Astrodon (which could reach foliage as high as 33 feet) was excavated from the McMillan water treatment plant. Fossil remains of the Rutiodon phytosaur were found near Dulles Airport and at Solite Quarry near Danville. The landscaping at Oak Hill, President Monroe's former home in Loudoun County, was enhanced with new walkways in 1920. Sandstone slabs were excavated from the quarry 3,800 feet north of the house. In those slabs were dinosaur footprints, which are highlighted today in the sidewalks, patios, and floors at Oak Hill. It was 17 tracks... It looked like a big chicken had walked through. 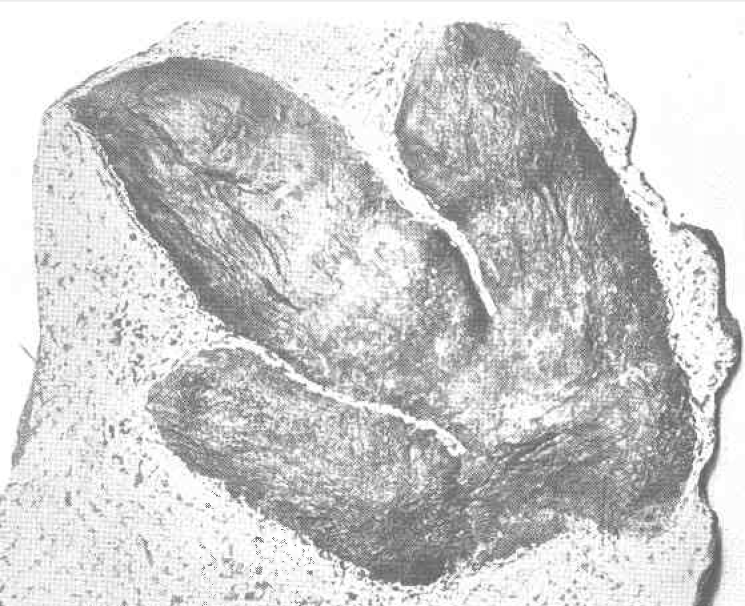 Analysis of 830 separate footprints at a higher level has revealed 32 separate trackways with six distinctive patterns. The different species thought to have made those tracks are Gregaripus bairdi, Agrestipus hottoni, Apatichnus minor, Anchisauripus parallelus, plus trackmakers Eubrontes and the smaller Grallator. Gregaripus bairdi and Agrestipus hottoni are thought to have been herbivores, while the other four were carnivores. Along the Rappahannock River, a research geologist and amateur paleontologist recognized that the local Cretaceous sediments in Spotsylvania County should contain trace fossils. After using a boat to explore the riverbank, they found tracks of the herbivore Sauroposeidon, which grew to 70 feet in length. 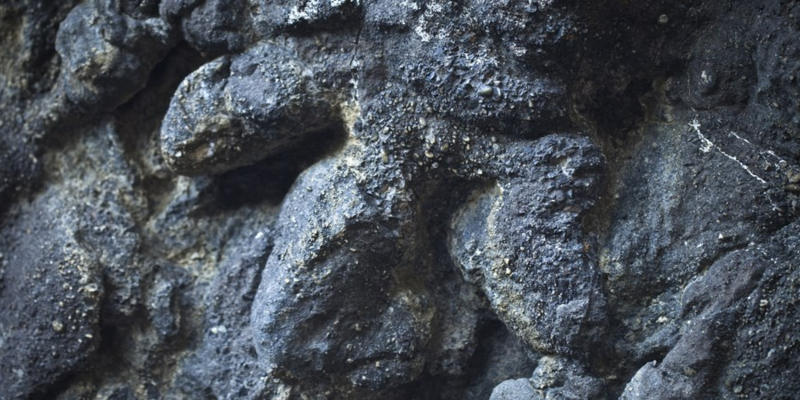 A footprint preserved in stone was 3-feet by 1.5-feet in size. Tyrannosaurus rex is the most famous dinosaur species. The tyrannosaur group existed for 100 million years, starting in the Middle Jurassic. They had colored feathers for display to attract mates and warn competitors. Starting 84-80 million years ago, some tyrannosaurs evolved into the large, unrivaled predators highlighted in so many dinosaur exhbits and movies. A Tyrannosaurus rex ate 250 pounds of meat daily. It had teeth and jaws so powerful that it is hardest-biting terrestrial animal of all time. It was the only dinosaur whose teeth could puncture through the bones of its prey. If a moviemaker shows a Tyrannosaurus rex biting through a car, that scene would reflect the actual capability of the top predator species. It could move up to 25 miles per hour for a brief chase, typically hunting in packs and ambushing prey with a short burst of energy. An assessment of intelligence known as the encephalization quotient, based on the ratio of the size of the brain to the size of the entire animal, suggests the Tyrannosaurus rex was as smart as modern chimpanzees. Tyrannosaurus rex, like many species of dinosaurs, had feathers 66 million years ago. They were used for display and controlling body temperature, but some species of dinosaurs at that time were also flying with feathered wings. Almost all of the dinosaurs died out in Virginia and across the world after a catastrophic meteorite/comet impact 66 million years ago in the Gulf of Mexico. In Virginia, all the dinosaurs not within underground burrows died in one brief period, the same day of the impact which formed the Chicxulub crater now located at the edge of the Yucatan peninsula. All wildlife and plants exposed on the surface were pelted by the hot particles. They ignited organic material directly, and the hot, hot air set every grassland and forest on fire. In what is now Virginia, it is likely that every animal and every plant that was not in a burrow or water was baked or burned to death. Black ash covered the earth's surface at the end of that dramatic day. Once-blue lakes and streams were grey with suspended soot, or black with a floating cover of once-green plants. That same day, earthquakes exceeding anything experienced in modern times rocked the land. Winds from the blast wave and the atmospheric heating exceeded the force of hurricanes and blasted the scorched landscape. A massive amount of water was displaced by the initial meteorite/comet impact. Ocean current patterns were disrupted again by the fast return of water into impact crater, which was briefly empty after the heat of collision caused a column of the ocean to flash into steam. The disruption at the impact site triggered tsunamis and seiche waves across the world. One wave, perhaps 50 feet high, swept inland from the Atlantic Ocean. It swept away the ash and whatever charred remains of dead dinosaurs were still on the surface. After the initial stunning effects, soot remaining in the atmosphere darkened the sky. That blocked sunlight and triggered a period of global cooling. Tiny particles of soot circulated in the atmosphere for months and years. Raindrops ultimately brought the soot particles to the earth's suface. Those raindrops included sulfur, in part from the vaporized rganic material and in part because the meteorite/comet hit where bedrock was rich in gypsum (CaSO4). The surfur reacted with the water in the atmoshere, acid rain fell from the skies, and the chemistry of lakes and the ocean shifted. The changes in temperature, acidity, and sunlight were too fast for the species to adapt by gradual evolutionary change. The impact killed 70% of the species on land and in the oceans. The vacated niches were filled by new forms of life as mammals replaced reptiles. 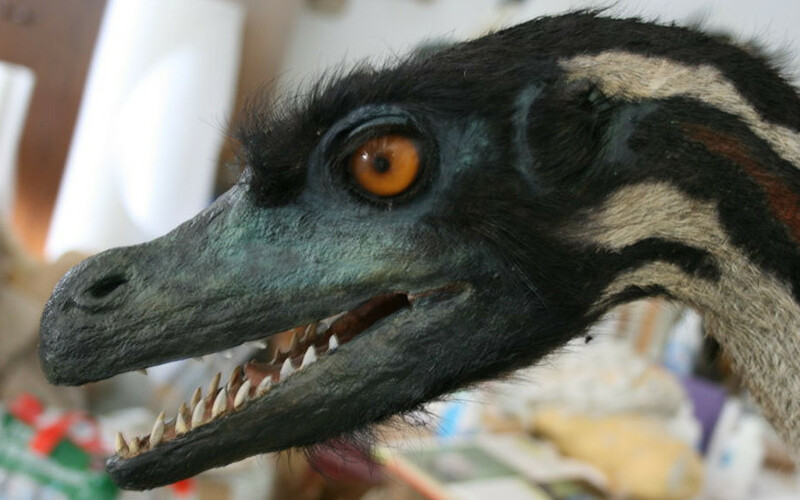 Most individual dinosaurs in Virginia died within one day. Almost all - but not all - dinosaur species disappeared within just a few thousand years.